APPETIZERS/ SNACKS/ STREET FOOD NORTH AMERICA U.S.A. Mention soba noodles and you will immediately think of Japan. Soba noodles are made of buckwheat flour and in Japanese language, soba does mean buckwheat. My mom and I are both noodle heads, however, she doesn’t care much for soba noodles. I, on the other hand, like all kind of noodles I can think of. Soba noodles can be used in both cold and warm dishes. I think I see the former more. I personally also like cold soba noodles. It is easy to overcook soba noodles and when you overcook them the texture just won’t come out right. 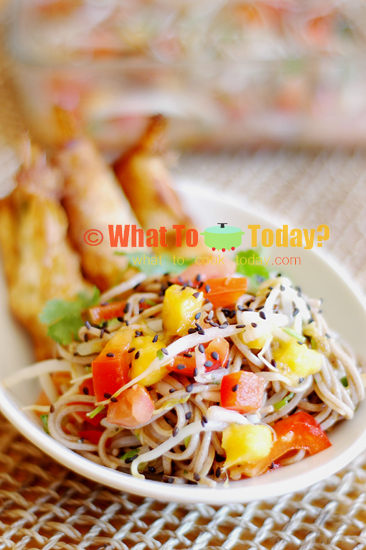 This soba noodles salad with sweet shrimp rolls is such a great combination. 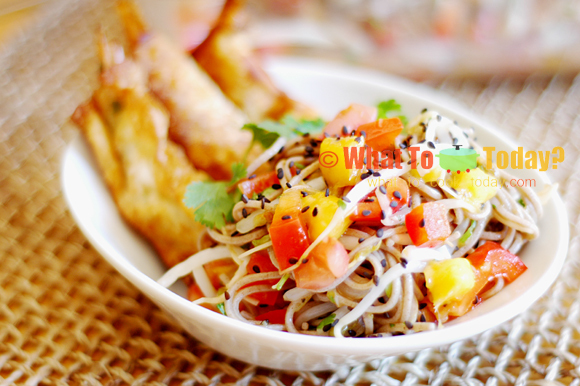 You have the noodles dressed in black sesame dressing and then tossed with vegetable such as bell peppers and bean sprouts and fruit like mango. 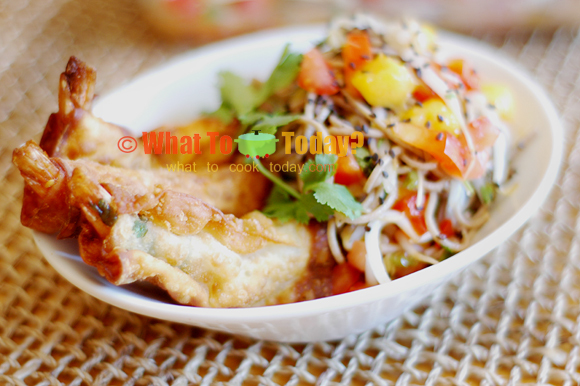 The soba noodles taste sour and sweet (from the mango) and it is such an appetite opener. Then you have this crunchy sweet shrimp rolls that you marinated in limes, ginger and coriander and then wrapped in wonton wrappers and fried until golden brown…ohhh my! The soba noodles and the sweet shrimp rolls go so well together. If you ask me, both can be eaten separately and they still taste good. Another great recipe from A Taste of Hawaii cookbook by Jean-Marie Josselin.